When the grated bread, ginger, cinnamon, aniseeds, and claret wine have been combined to a stiffe paste for the receipt (recipe) To make Ginger Bread, the paste is driven thin and printed in the moldes. Dust your moldes with Cinamon, Ginger, and liquorice beeing mixed together in fine powder. 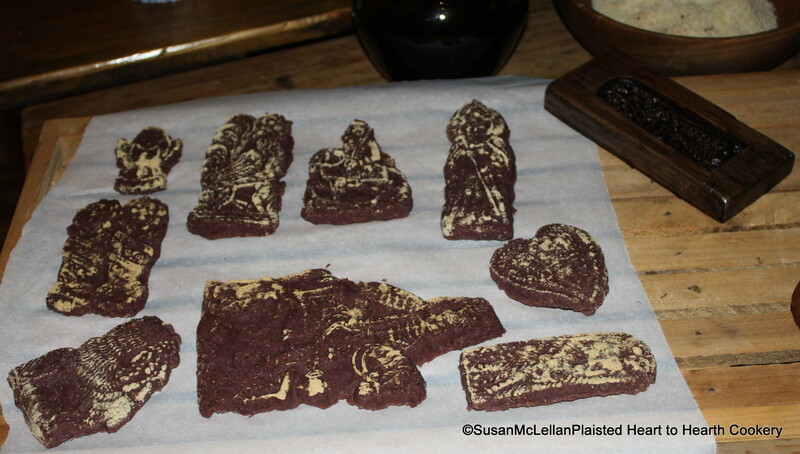 One of my reproduction Laxa family gingerbread molds, Mini-Madonna (circa 1670) is to the right of the molded gingerbread. oh of course, dust the mould! I recently bought an old Dutch springerle mould in an attempt to reproduce the moulded gingerbread recipe found in A Boke of Gode Cookery. It stuck so badly it was a total disaster! I oiled the mould, next time I will dust…..
And show off your wealth and status with dusting extravagantly! It works the best.